1) "Well the other times have only been dreams, but THIS time this is real." 2) "I am so glad I am not dreaming this time." 3) "Finally--my dream comes true." 1) I can't find the cashier and I wake up. Get the gist? I never actually GET the stuff. Reality always comes in the morning. 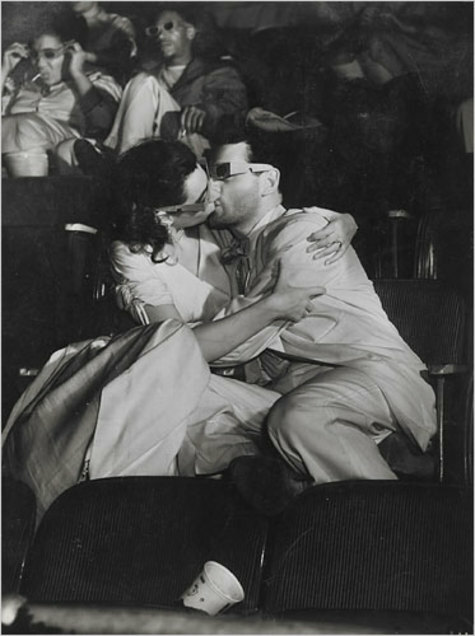 So imagine my vicarious thrill, not to mention envy, when I read in this article in this morning's New York Times that two women from Indiana came upon an old Zebra striped suitcase at a yard sale, filled with actual photos and papers from one Arthur Felig, AKA Weegee the famous photographer of New York’s darker side. Whoa! Isn’t that kind of discovery the things that dreams are made of? More than antiques, more than great old funk, I dream of finding that lost piece of art or ephemera. So, this is what I have learned: treasure hunting dreams CAN come true, even if they come true for someone else. In all honesty, I do have to 'fess up to this: once, years ago, I was part of a mothers’ group that got together every week. One week, the mother having the group tricked us all, and, lo and behold, there was a Tupperware hostess primed and ready to demonstrate the latest in keeping food fresh. I was furious and refused to participate. Never mind that I actually liked the sippy cups. There was no way I was going to ruin my record on living a life without doing the party scene for them. I had to leave. So I guess I should say I have never WILLINGLY attended a Tupperware party. Why the intense disgust? Somehow the idea of throwing or attending a party whose main theme was plastic food storage containers was singularly upsetting to me. Hard to say why, except that I guess I fought organized and mundane domesticity with a fervor, and Tupperware just stood for everything about that kind of life that bored me out of my skull. It still does. “Dixie’s Tupperware Party” which is running through June 17 at Ars Nova on West 54th Street. 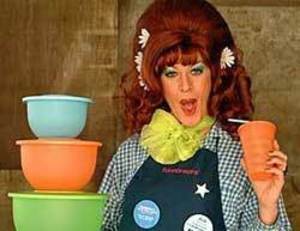 The best part about this show: Dixie is a guy in drag doing his version of the supreme southern belle Tupperware gal. Even better, is that you can not only enjoy the humor, but you can actually buy the goods. Yes, you read that correctly: it REALLY is a Tupperware Party! Oh, the pity!!! I do not think I can get down to NY to see this show before it closes. Damn! Isn’t that the perfect twist of fate that I deserve? 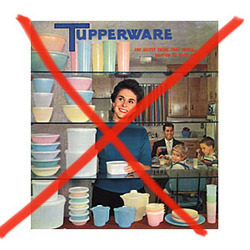 Finally, I actually WANT to go to a Tupperware Party and I can’t!! Of course, maybe I will get invited to a party like this one.